Related to my last post of medieval musings, the other important methodological concern that characterised my research this year was not simply paying attention to paratextual elements in manuscripts but to their contents as a whole. It may be a gross oversimplification to say this, but in a great many studies of canon law, there is an ever finer process of definition and cutting away. Thus, someone who studies decretals will look at the first 18 folios of a manuscript and pay no heed to the copy of Gratian to which the decretals are attached. Or someone who does canon law will look at the ‘canon law’ section of a miscellany but not its theological section. Once again, however, when we put ourselves in the reader’s seat, we cannot look at the manuscripts in this way. When I study Durham’s six glossed copies of Gratian’s Decretum, I am interested in what else I may find. 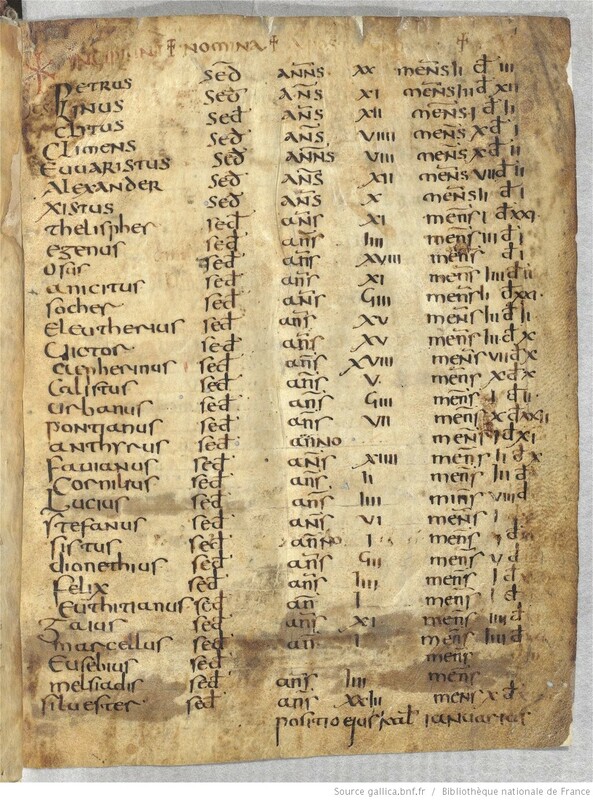 Durham Cathedral Library MS C.III.1, for example, begins with a ‘homemade’ canonical collection with excerpts from a variety of sources, including a papal catalogue, an arbor consanguinitatis, and a decretal collection. And then a glossed copy of Gratian of similar date but a different hand. If these were bound together early, most readers will have had their reading of Gratian shaped by this other material, not just the glosses. One result, for example, is the emphasis on papal authority that comes from the papal catalogue and the decretal collection. Also, the ongoing controversy in canon law about marriage is cast into sharp relief by the arbor consanguinitatis. Another example that my boss told me about two days ago is the fact that, once the Latin translation of John of Damascus De fide orthodoxa is complete, Anselm’s Cur Deus Homo finds itself always transmitted with the Damascene. Somehow, people found a resonance between these two documents. Those who read the texts would inevitably be influenced by this editorial decision. I once queried why notitiae of Roman provinces find their way into canonical collections. The answer is that Carolingians in the ninth century created a system whereby the bishop of the Roman province number Prima in those notitiae was the Primas, the Primate, with certain rights and responsibilities to those below him. So the administrative structure of a long-dead empire was suddenly of great interest, and people copied these texts. If all I did with a manuscript was read the ‘canon law’ material, I would miss this important nuance in the reader’s experience. Rosamond McKitterick, in History and Memory in the Carolingian World, has argued that by collecting papal letters alongside church councils, the authority of the popes in matters of canon law was reinforced. It makes sense when you read the whole manuscript together, doesn’t it? Examples abound. This is a useful approach, and it certainly helps one understand some texts when they don’t seem to make sense in any other way. This entry was posted in Books, Christianity, History, Mediaeval and tagged anselm of canterbury, canon law, decretals, decretum, gratian, john of damascus, manuscripts, papal catalogues, rosamond mckitterick on July 26, 2018 by MJH. This entry was posted in Christianity, History, Mediaeval and tagged canon law, decretum, durham cathedral library, durham cathedral priory, gratian, theology on June 29, 2018 by MJH. This week, I spent some time analysing three of Durham Cathedral Library’s canon law manuscripts, C.II.1, C.I.7, and C.III.1. All of these are from the late twelfth or very early thirteenth century. Sadly, none is yet digitised. They are all manuscripts of Magister Gratian’s so-called Decretum, a canon law collection put together around 1140 in Bologna (original title: Concordia discordantium canonum — Concord of discordant canons). They all include glosses — marginal commentaries keyed to individual words in the main text. C.II.1 and C.I.7 have the same base gloss. The University of Bologna, where Magister Gratian taught, has a strong claim to being Europe’s first university (as we understand the term), and where the scholastic study of both Roman and canon law was born in the 1100s. With the rise of the university comes the need for textbooks. We all know this today — as an undergraduate, I used Wheelock’s Latin, Greek: An Intensive Course, A History of the Roman People, all books designed specifically for teaching, for the classroom (the schola in medieval terms; thus scholasticus, thus ‘scholasticism’). Gratian’s Decretum is that textbook for most of the rest of the Middle Ages, although as the body of papal legislation ramps up in the 1200s, it becomes necessary to supplement Gratian in the classroom with the new laws. Gratian offers the reader a systematic setting forth of church law. He begins with what many call the ‘Treatise on Laws’, a discussion of what natural and customary law are, what their domains are, what justice is, whether laws can be unjust, and what the sources of authority in law are amongst other concerns. The Decretum as most people used it from the 1150s on, then systematically treats different sub-areas of canon law. Following the scholastic method, Gratian lays out for the reader different opinions from various authorities (councils, popes, church fathers) and seeks a way through them where they differ, finding the concordia of the book’s title. When the authorities themselves do not naturally create a resolution, Gratian will give his own. The result is a massive compendium of canon law covering most of what one needs to know in the mid-1100s. It is much larger than, say, the Decretum of Burchard of Worms from the early 1000s (having held manuscripts of both, I can attest to this fact). Nevertheless, Gratian’s Decretum fills the need for a canon law textbook, a need keenly felt, given how quickly it was dispersed and how full its dominance really was. Take note that canon law is the one subject taught at all medieval universities and that some of the cathedral schools, such as that of Lincoln, closed because they did not offer canon law. A textbook such as this had a wide audience and great potential. I think also, however, that it creates a need. With a text suited to the methods of the twelfth-century classroom becoming widely available, more people would be able to become more deeply acquainted with the broad range of church legislation that Gratian had compiled. It became the set body of esoteric knowledge needed to become a professional in canon law. With everyone teaching it and learning from it, anyone who wanted to make a case in an ecclesiastical court or through a written plea/appeal or simply who wanted to get a job done in compliance with church law, would have to have either someone versed in canon law at hand or be that person him’erself (usually him, this being the Middle Ages, but not always). Thus, by its very popularity, Gratian’s Decretum created the need for Gratian’s Decretum. We don’t have four copies in Durham for no reason. No matter how good Ivo’s Decretum or Burchard’s or the Panormia attributed to Ivo was, without the particulars of law as set out in Gratian’s Decretum, one would be at a disadvantage in the brave, new world of burgeoning canon law and the growth of the western church as a legislative institution. So everyone got a copy. This entry was posted in Books, Christianity, History, Mediaeval and tagged canon law, decretum, durham cathedral, durham cathedral library, gratian, manuscripts, scholasticism, textbooks, university of bologna on March 23, 2018 by MJH. Every once in a while you are confronted with ‘important’ periods in history — 135 BC to AD 14, for example, takes us through the collapse of the Roman Republic to the death of Augustus, the first Emperor. Or the fourth century, with the continuation of Diocletian’s reforms, Constantine’s conversion to Christianity, the various church councils and associated theologians, all culminating in what Peter Brown calls the ‘second’ Golden Age of Latin literature. Or the 16th century, an age of Reformation and print and philosophy and war. The 12th century is similarly important, especially its middle decades. The final year of the 11th century is the year the Crusaders took Jerusalem. The final decades of 1000s also saw the Investiture Controversy and the Gregorian Reform, which continued beyond 1100 and adjusted the balance of secular and ecclesiastical power in Europe. In the midst of this is St Anselm (1033-1109), whose Cur Deus Homo was completed in the year 1100; this brilliant logician and theologian was to die in 1109. Not that Latin theology was left with no new lights in the upcoming decades — St Bernard of Clairvaux (1090-1153) helped drive forward the new Cistercian Order and is a high point in western mysticism, particularly his sermons on the Song of Songs, begun in 1135; he is often called the Last of the Fathers and is a ‘Doctor’ of the church. Bernard sharpened his wit in intellectual combat against Peter Abelard (1079-1142), who is an early ‘scholastic’ theologian (whereas Bernard was a monk) who was more given over to Aristotle than to Plato, to logic than to mysticism, and who was involved in the methodological revolution in the universities that we call ‘Scholasticism’. Abelard was important and is known even to non-medievalists today, often because of his relationship with Heloise and their illegitimate son, Astrolabe (we have even a Penguin Classics translation of their letters!). However, some of his controversial conclusions were rejected by the succeeding tradition; one of his successors, Peter Lombard (1100-1160), on the other hand, wrote what would become the standard textbook of theology for the Middle Ages, the Sentences (1147-50), on which the luminaries of the next century, such as St Thomas Aquinas (1225-1274), would write commentaries. Although his orthodoxy, like Abelard’s, was challenged, his memory was acquitted at the Lateran Council of 1215. Around the same time as Peter Lombard’s greatest work and the mystical masterpieces of St Bernard, but in the final years of Abelard, Gratian wrote his Decretum — or, rather, ‘Concord of Discordant Canons’. This is one of the most influential works of canon law from the Middle Ages, drawing together the various sources of the law under systematised headings and providing Gratian’s own dicta to sort out the discrepancies between. It is at once a source for canon law, a juristic text for legal principles, as well as a study in Christian sacraments. The Decretum is a wondrous piece of 12th-century learning, born in the university at Bologna in 1139 with final edits in the 1140s. Like Lombard’s Sentences it would become a standard textbook for the rest of the Middle Ages. These are what initially inspired me to write this post. Nonetheless, this is also the century of the birth of Gothic art under the vision of Abbot Suger of St-Denis; the great architecture of Norman Sicily comes this century as well. Towards the end of the century the Nibelungenlied — Germany’s great vernacular epic — was written (I’ve blogged on it here often in the past). The latter half of the century also sees Chrétien de Troyes (1130-1191), Marie de France (fl. 1160-1215), and Hartmann von Aue (1160-1210s). This the century of that medieval stereotype, the troubadour. No piece about the twelfth century should go without mentioning the dubiously historical work of Geoffrey of Monmouth (1095-1155), that famous History of the Kings of Britain was written, including many famous tales of King Arthur. More reliable was William of Malmesbury (1095-1143), who wrote several important works of English history in Latin prose. One could go on. It’s interesting to see these convergences, especially the significant pieces written 1140-60. 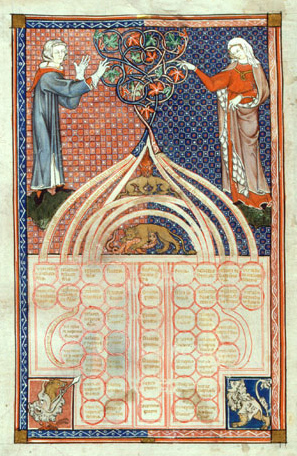 This entry was posted in Books, Christianity, History, Literature, Mediaeval, Monks and Monasticism, Philosophy and tagged abbot suger, anselm of canterbury, bernard of clairvaux, decretum, gothic architecture, gratian, nibelungenlied, peter abelard, peter lombard, scholasticism, st denis on June 11, 2017 by MJH.